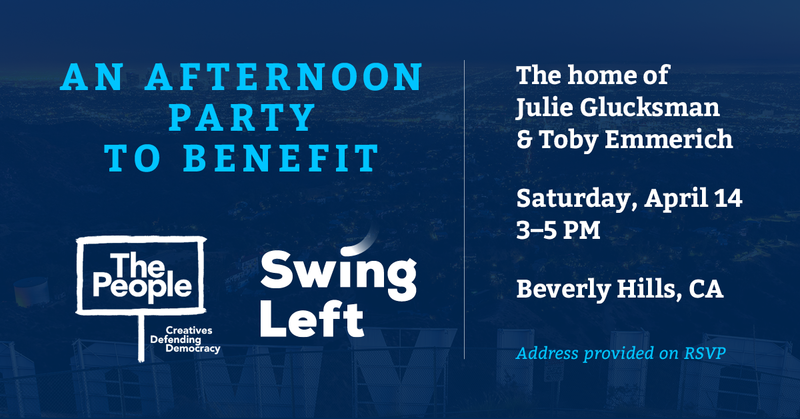 Join us for an afternoon party in support of SWING LEFT and THE PEOPLE, two amazing organizations dedicated to helping Democrats win seats across the country. The event will include remarks by leadership from both organizations: Swing Left Executive Director and Co-Founder Ethan Todras-Whitehill, Swing Left Chief Marketing Officer Michelle Finocchi, The People Founder Michael Hirschorn, and The People Political Director Christine Bachman. Tickets start at $250. Space is limited. Swing Left is a national grassroots network of volunteers supporting Democratic candidates in Swing Districts, with the goal of flipping the House in 2018. Swing Left is building the 2018 campaigns-in-waiting in two ways: by recruiting and training an army of volunteers and by raising a pot of money, so the Democratic nominee in each District can hit the ground running on day one. Swing Left has grown to over 300,000 volunteers supporting 70 Swing Districts across the United States. Go to swingleft.org and enter your zip code to find the Swing District nearest you. Once you sign up, we’ll follow up with actionable, impactful ways to get involved. The People PAC is a coalition of creatives and techies using the tools of pop culture, social media, and documentary film to develop and deploy cutting-edge content in defense of democracy. In Virginia 2017, The People created ads for 16 House of Delegates candidates, helping flip 15 seats and increase voter turnout by 20 percent. In 2018, The People is scaling its model and going after state-level chambers across the country. The Statehouse Initiative will provide media support for up to 100 state-level candidates in 3-5 states, including Michigan, Florida, and Pennsylvania. With the 2020 census and gerrymandering on the horizon, as well as the very real threat of a constitutional convention, we believe that our Democracy depends on the success of these efforts.